mein aapko apni company ke Vishay mein batana chahati hoon. Hamari company ka naam “Häckl Treuhand GmbH”. Yeh ek international company hai or city Munich ke nazdeek hai. Hamari company ka mukhya karya, private citizens tathha viyaparion (businessmen) ko tax ke prati madad karna hai. Hum financial accounting, pay slip tathha balance sheet tyar karte hain. Naya viyapaar kaise shuroo karna hai hum us mein bhi aapki madad karte hain, controlling ewem accounting mein. Hum aapko yeh bhi btaeinge ki aap ki company kaisi chal rahi hai matlab aapko kitna faida hoya hai or aap iss faide ko kaise vadhaa sakte hein, aapko tax kitna dena hoga or kaise aap tax kamm kar sakte hein. Aagar aap koi anya jaankari chahte hain to kripya call karein. Vorrei presentare brevemente il nostro studio legale tributario. Con ufficio sul campo nella capitale bavarese Monaco. Noi servizio sia per gli individui e le piccole e grandi aziende di tutte le forme giuridiche. In questo contesto, noi creiamo la contabilità finanziaria, paghe, bilanci e dichiarazioni dei redditi. Non vediamo l'ora della tua e-mail / chiamata! We’re a family with local roots and a global network, and we’re committed to the digital future. 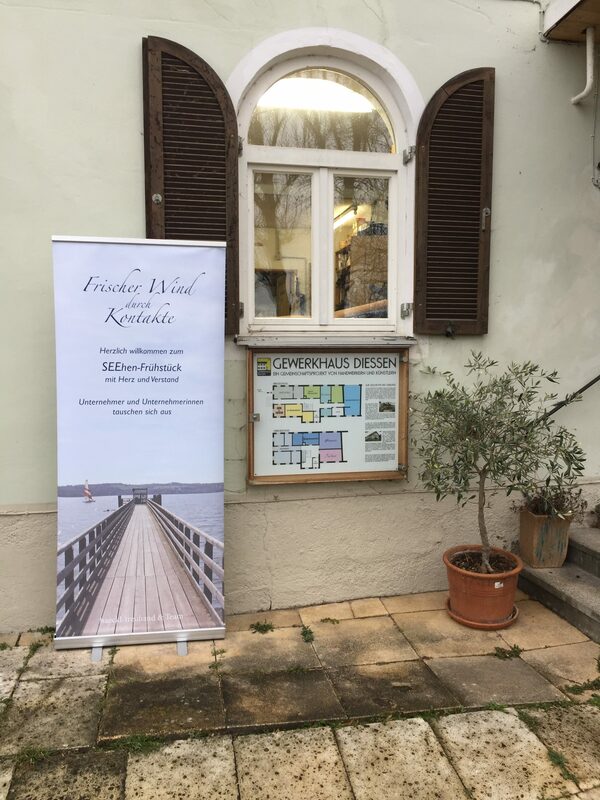 Come visit us at our offices on the Ammersee. Let’s get to know one another, perhaps over a meal at a lakeside restaurant. Reinhard Häckl has been in business for 35 years and uses his extensive networking and professional skills to benefit his clients. He supports and advises clients in all matters concerning law, taxation and business economics. Mr. Häckl provides a full range of consulting services, saving clients the time and expense of seeing multiple consultants. His 35 years of self-employment and the development of a 50-member team point to his successful entrepreneurship. Mr. Häckl is well known among young entrepreneurs and startups, with whom he shares his expertise. 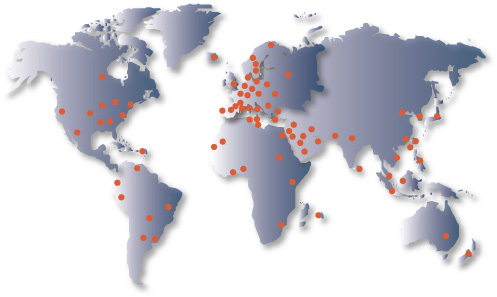 He has excellent international contacts, many of whom have been clients for 25 years. Networking for the benefit of his clients – that’s his mission. Alexander Zink works in his own firm as an auditor in partnership with Mr. Häckl. Together, Mr. Zink and Mr. Häckl offer auditing services with a personal touch: Both are present during audits, ensuring clients have access to their full range of knowledge. Mr. Zink offers an integrated, entrepreneurial approach to consulting work with regard to the technical, economic and legal framework. He works as a partner with Mr. Häckl on all kinds of audits. Anne Neumair finished her vocational education as assistant tax consultant in 2009. In 2014 she successfully completed the „Bachelor of Arts in Real Estate Management“. Additionally she graduated the „Master of Arts in Taxation“ in 2016. In springtime 2018 Anne Neumair passed her latest exam and is now a „tax consulatant“. Since June 2018 she strengthens our team of Häckl Treuhand GmbH and is glad to help our clients in word and deed. Marianne Häckl has been an assistant tax accountant for more than 20 years. She has provided close support in particular to our smaller and medium-sized clients, personally delivering documents and answering relevant questions on site. Her areas of expertise include wages and salaries, accounting, balance sheets and all relevant issues. Ms. Häckl is the backbone of our office, the go-to person for all kinds of information. Our trainee tax assistants have all benefited from her input. Ms. Häckl is a partner in Häckl Consulting. Caroline Häckl is Ms. Digital – digital accounting is her expertise, along with all relevant technical and legal issues. She is also passionate about controlling and handling complex accounting tasks. Serving international clients is her specialty. Thanks to time spent with our colleagues in Los Angeles, Ms. Häckl also is experienced in US GAAP. 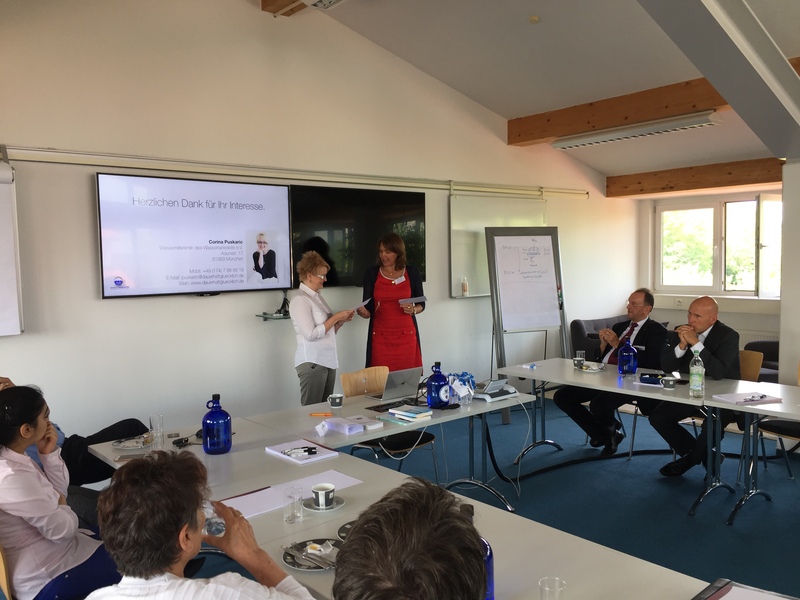 Ms. Häckl's duties as chair of the organization Wirtschaftsjunioren (Junior Chamber International) and as regional speaker have made her an excellent networker. Clients seek her advice far beyond the field of tax law. Katrin Rochelt completed her education as assistant tax professional within two years. Since 2009, she has been assisting clients in bookkeeping and payroll accounting. She also prepares financial statements and tax returns. 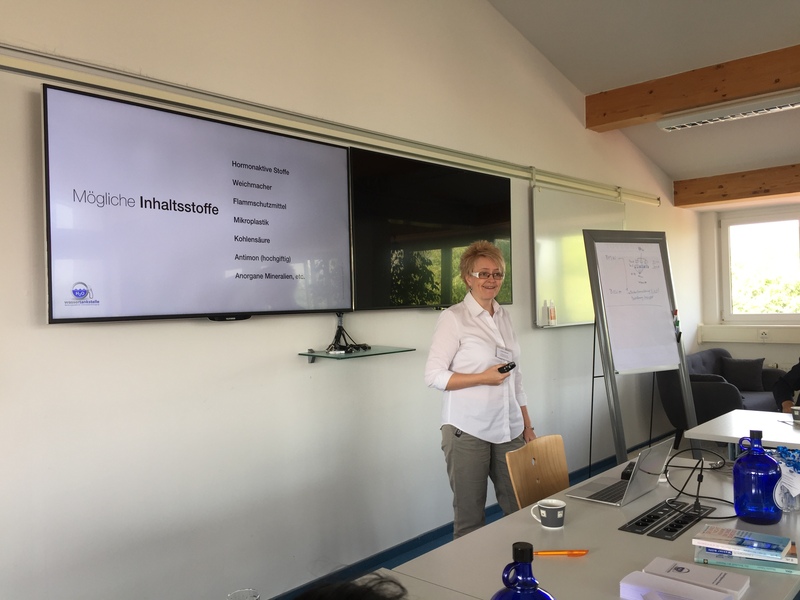 In January, 2018 Mrs. Katrin Rochelt successfully completed the advanced training as professional assistant for wages and salaries. Ms. Rochelt is customer service-oriented and enjoys advising clients. Tanja Dusch worked as an assistant tax consultant after completing her professional training in 2001. Ms. Dusch enjoys advising clients as a member of our team. Eva Bengestrate completed her training as assistant tax professional in 2006. In 2011, she became a certified tax specialist. She has been working independently with clients from all kinds of businesses. Her areas of expertise include tax returns, balance sheets, profit assessment, digital bookkeeping and payroll. She also assists with startups, business plans and controlling work. Marie-Louise Krafzik completed her paralegal studies in 2014. She then completed a distance learning course in bookkeeping. Her responsibilities include bookkeeping and office management. Susanne Meyer completed her training as a tax professional in 2004. She worked for many years in accounting at an international company. Ms. Meyer handles payroll and financial accounting for our clients. She works as a cooperation partner. 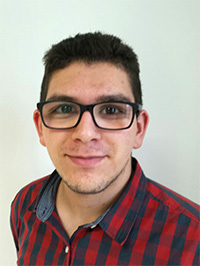 Manuel Favara has been a tax specialist trainee at our firm since September 2015. He is experienced in information technology and is ready to use his skills to help our clients. Manuela Schönauer has been a trained assistant tax consultant since more than 30 years. As part of this occupation she creates accountings and payrolls for mandates of different scopes and extents. Annual accounts and tax declarations also belong to her assignment. Furthermore she additionally completed the training as a paralegal. Therefore she is able to do default actions as well as foreclosures for our mandates. Andrea Dallmair received her degree in banking in 1997. Through her many years in banking she gained experience in business. Ms. Dallmair works as a secretary, ready to help our clients with their business concerns. Harsimran Puar has been a trainee for tax consultant assistants at our company since September 2017. She went to the college of further education and got the Advanced Vocational certificate of Education in 2016. 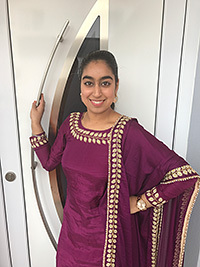 She speaks Hindi fluently and is ready to use her skills to help us and our Indian clients. Corinna Lay has been a business administration manager trainee at our company since September 2017. She went to the college of further education and got the Advanced Vocational certificate of Education in 2012. She is ready to use her English-skills for our foreign clients and to help you in all your matters. As a highly qualified tax consultant and accountant, Yvonne Heinke has specialized in tax matters related to international staff assignments. In particular, HR departments of medium-sized companies are among her clients. Ms. Heinke has advised clients since 2003 -- not only at her own firm but at her clients' businesses as well. In addition, Ms. Heinke holds regular training sessions for tax consultants and their staff. She also holds seminars and workshops to instruct HR generalists and payroll staff on international fiscal law. As an independent transport administrator, Nicola Bernard has been consulting in the field of import and export logistics for more than 15 years. Based on her experience in international freight forwarding and general trade, she offers her expertise to clients who seek advice in foreign trade matters. Ms. Bernard personally guides clients from the initial steps through the execution and completion of their projects. Her strengths include ensuring legal certainty, optimizing transparency and freight transportation, and guaranteeing payment in international trade. Her office of foreign trade has been AEO-F certified since 2009. 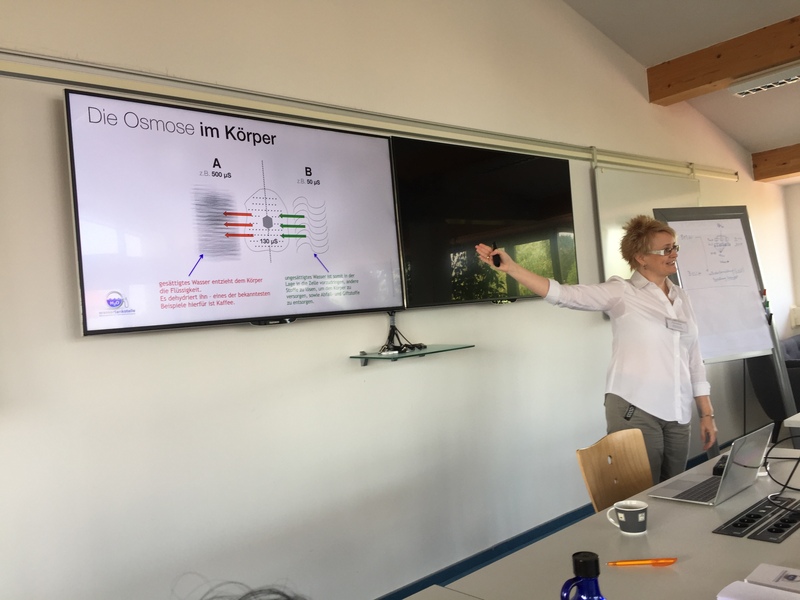 Ms. Bernard also teaches the basics of foreign trade and beyond to aspiring export managers at the IHK Akademie Schwaben. We consult on all kinds of tax matters for your business. Benefit from Reinhard Häckl’s 35 years of experience and his wide range of knowledge. We listen to your questions and provide competent answers and support. IT PAYS TO KNOW YOUR NUMBERS. This is where Caroline Häckl can help. She will make these core business numbers clear and understandable for you. Ms. Häckl develops concepts and establishes controlling systems tailored to each entrepreneur. Please contact Ms. Häckl for an initial nonbinding appointment, and together we’ll find out how we can best support you. Let us handle your payroll. Our mission is to handle your payroll duties so that you can concentrate on running your business. You can depend on us not only for the monthly handling of wages and salaries but also in the event of fiscal audits. You can rest assured you’ll be in safe hands. Marianne and Reinhard Häckl would be happy to advise you. Ask Caroline Häckl anything about digital accounting. We will establish a modern and efficient digital system for you, eliminating paperwork and freeing you from filing duties. 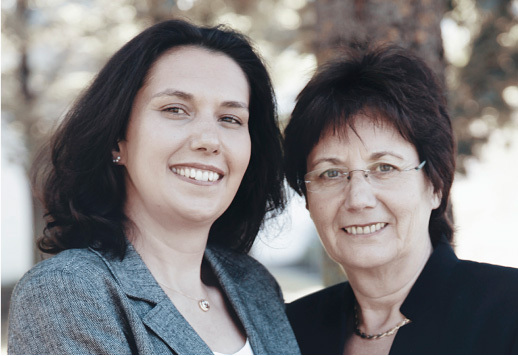 Caroline and Marianne Häckl look forward to meeting you and discussing the benefits of a paperless accounting system. We prepare, review and revise management contracts and documents for all legal forms of business. We also handle default summons and enforcement orders against delinquent customers. Reinhard Häckl would be happy to provide legal advice. It’s easy for a company to send staff across borders. But what happens then? Reinhard Häckl has 35 years of experience supporting companies that expand abroad. He personally knows his colleagues across the globe, whether in Hong Kong, Los Angeles, Sydney or London. Wherever you do business, Mr. Häckl can provide the right contact person to help you set up a tax structure for your company. Protect yourself against any unpleasant surprises such as legal actions and claims that you might face unexpectedly many years later. Benefit from Mr. Häckl’s 35 years of experience. Mr. Häckl provides valuable advice seven days a week, 24 hours a day. Please call for an appointment. Reinhard Häckl returned to school in 2014 for a 120-lesson course on business succession so that he could provide expert consulting in that field as well. Clients will get reliable information about every aspect of business succession, from planning and implementation to inheritance law and fiscal legislation, as well as corporate valuation, executorship and foundations. You can trust Mr. Häckl’s expertise in this field. Forward-thinking consultancy – that’s Mr. Häckl’s goal. Clients benefit from his services as a cooperating public accountant. As a member of the advisory council of the Chamber of Public Accountants in Berlin, Mr. Häckl plays an active role in determining the profession’s future – long before others even begin to consider it. It’s all for the benefit of his clients. Contact Mr. Häckl anytime. We would be happy to support you. Die Beratung in diesen Feldern ist besonders intensiv und verlangt nach bester Vernetzung, die Reinhard Häckl seit 1992 pflegt. Alles was junge Menschen für ihr Start Up brauchen – vom Praktiker, der selbst dreimal gegründet und zweimal verkauft hat, zudem das Fachwissen auch theoretisch besetzt. Private Investoren sollten wissen, wem sie ihr Geld anvertrauen, hier ist die Beratung von Reinhard Häckl genau richtig. Er betreut Family Offices mit all ihren Finanzangelegenheiten aus langer Erfahrung und sieht auch auf die Compliance Vorschriften und deren Einhaltung, damit Strafverfahren, an die man gar nicht denkt, vermieden werden. In enger Zusammenarbeit mit einem Family Office nutzt Reinhard Häckl seine gesamte Erfahrung zum Vorteil seiner Kunden. Auch die Stiftungsberatung gehört hierzu. 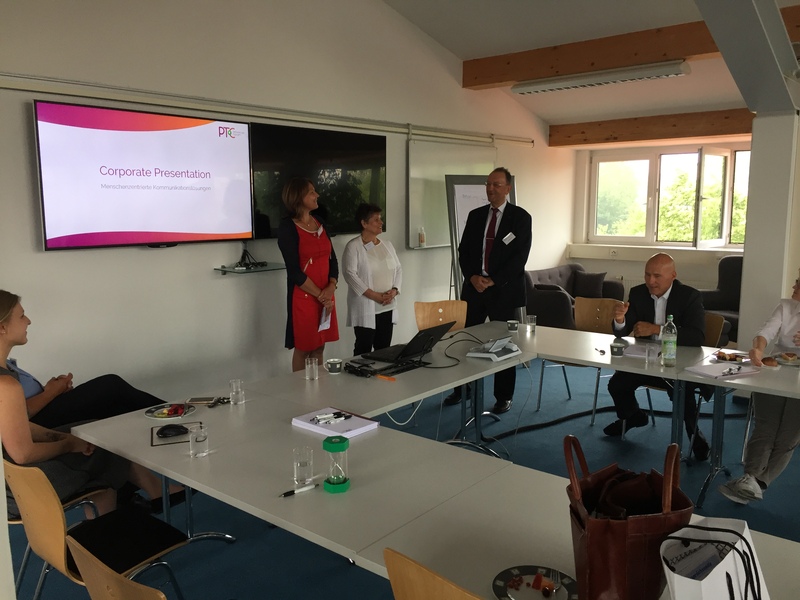 IHK Gremium (Advisory Board of the Chamber of Commerce and Industry) | Mr. Häckl acts as a vice chairman in the Bavarian cities of Landsberg and Weilheim. 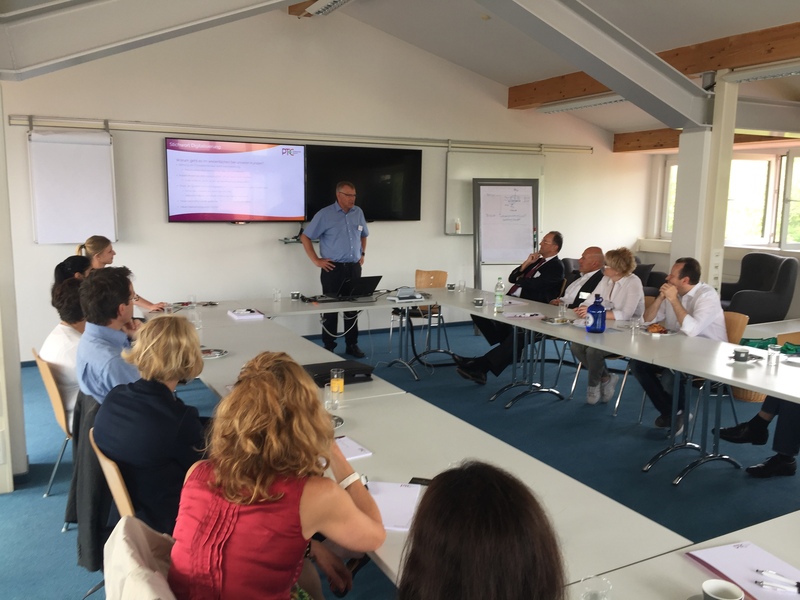 IHK Finanzausschuss (Finance Committee) | Mr. Häckl gathers information on the latest developments regarding future fiscal regulations. 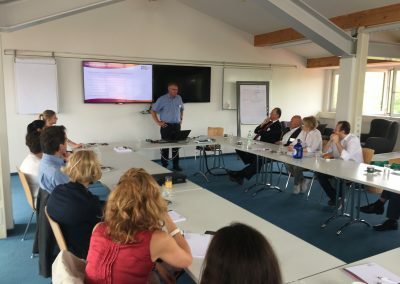 Bund der Selbstständigen (Association of Self-employed Entrepreneurs) | As the association chairman, Mr. Häckl organizes meetings and events in his home region. BayStartUP | Mr. Häckl has been actively involved from the start, providing valuable feedback on hundreds of business plans over the past 20 years. He also coaches startups. We donate up to 1% of our annual net income to the foundation Helfen und Fördern (Helping and Fostering) to support local people in need. The foundation also aims to encourage youths to acquire an entrepreneurial mindset. An annual report on our website documents donations and projects. Help us to help others – both by working with us and by donating funds to projects you wish to foster. Consult with us on how best to set up a foundation and how to make sure your donations help fulfill the purpose you intended. 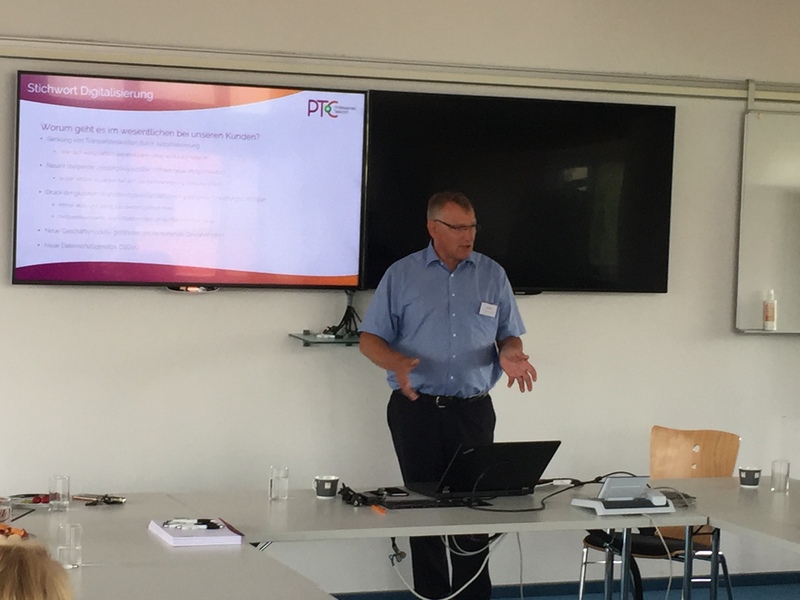 Reinhard Häckl has been a member of a foundation advisory board for many years and knows all relevant regulations in detail. You can trust and depend on him to properly manage your funds. 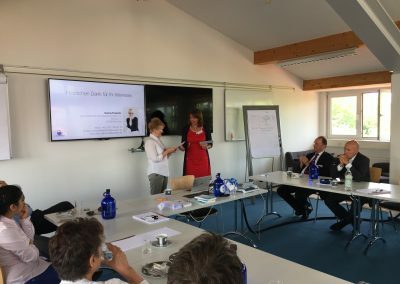 In addition, Mr. Häckl takes part in the foundation meetings of Munich’s Reuschel Bank, where he obtains firsthand information to pass along to his clients. 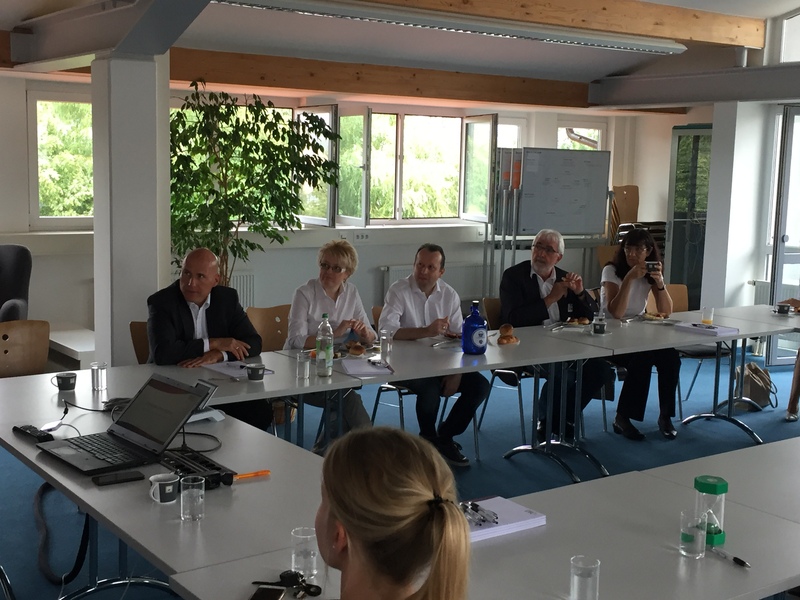 Mit sehr viel Schwung wurde in Hofstetten das neue Unternehmernetzwerk für den Landkreis Landsberg gestartet. Über 25 Unternehmer fanden sich auf Einladung von mib – Mittelstand in Bayern e.V. und organisiert von dessen Präsidenten Ingolf F. Brauner, dessen Vize Reinhard Häckl und dem Unternehmer Andreas Jochim, ebenfalls mib Mitglied, ein. In einem Impulsvortrag stellte Hr. Brauner die wichtigsten Verhaltensgrundlagen für erfolgreiches Netzwerken vor. 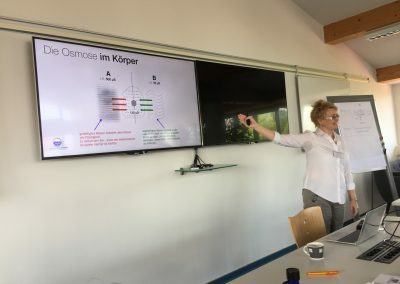 In der nachfolgenden moderierten Diskussion zeigten die anwesenden Unternehmer und Existenzgründer so viel Engagement, dass sich spontan Mitstreiter für die Weiterführung des regionalen Netzwerks unter dem Dach von mib gefunden haben. Das auf aktives Mitmachen ausgelegte Veranstaltungsformat fand unter den Anwesenden große Zustimmung und soll auch künftig so beibehalten werden. Die nächsten Themen stehen auch schon fest: Digitales Bank- und Finanzwesen, aktuelles Steuerwissen, DSGVO und Datenschutz. Ziel ist jeweils, in der Gemeinschaft aktuelle Fragen aufzugreifen und im Dialog Lösungen und Hilfestellung für den Einzelnen zu finden. Das nächste Treffen wird nach dem Jahreswechsel stattfinden, es wird um die für kleine und mittlere Unternehmen wichtigen Folgen der aktuellen Steuergesetzgebung gehen. Selbständige und mittelständische Unternehmer, die künftig dabei sein möchten, können sich unter info@mibbayern.de in den Verteiler aufnehmen lassen. 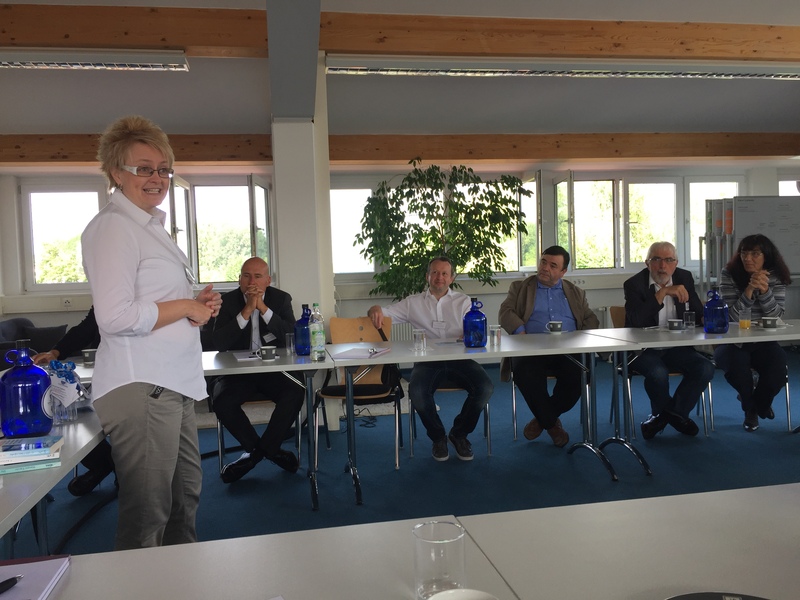 Im Rahmen seines Amtes als Vorsitzender des IHK-Regional-Ausschusses Landsberg am Lech hatte Herr Häckl zusammen mit IHK-Vizepräsidentin Ingrid Obermeier-Osl die besondere Ehre, Bayerns beste Auszubildende ehren zu dürfen. Die Ausbildungen erfolgten in unterschiedlichen handwerklichen Bereichen. Ein wichtiger Schritt, um dem Fachkräftemangel entgegen zu wirken. Wir gratulieren zu dieser besonderen Leistung! Im September nutzten viele junge Menschen die Chance, sich auf der Ausbildungs-Messe in Kaufering um einen eventuellen Ausbildungsplatz umzusehen und sich über das Berufsbild des Steuerfachangestellten (m/w/d) oder des Steuerberaters (m/w/d) zu informieren. Ebenso bestand reges Interesse in den Reihen der Schüler am Beruf des Kaufmanns für Büromanagement (m/w/d). Herr Häckl mit seinem Team bildet diese Berufe aus, ist sogar Ausbildungsbetrieb der IHK 2018. Da versteht es sich natürlich, dass die Kanzlei auch mit einem Stand auf der Messe vertreten war. Reinhard Häckl wurde erneut in den Beirat der Wirtschaftsprüferkammer gewählt. Die Wirtschaftsprüferkammer ist die Berufsorganisation für ca. 21.000 Wirtschaftsprüfer, vereidigte Buchprüfer und Wirtschaftsprüfergesellschaften. Der Sitz der Kommune ist Berlin und der Beirat entscheidet die wesentlichen Belange des Berufsstandes. Reinhard Häckl freut sich über die Wiederwahl und setzt sich sehr gerne für die Belange der kleineren und mittleren Kanzleien ein. Bei den Kolleginnen und Kollegen bedankt er sich für die Wahl! Reinhard Häckl formte am Ammersee eine moderne, neue Steuerkanzlei von „Null auf Hundert“. Aus Dankbarkeit dies – nach einem Schlaganfall – gesund zu bewältigen, spendete er zusammen mit seiner Frau Marianne, an die Stiftung „Gemeinsam e.V.“ in Schondorf. „Gemeinsam e.V.“ kümmert sich um diejenigen, denen es nicht so gut geht und Hilfe benötigen. Im Rahmen der 3. Ammersee-Schifffahrt wurde an Hr. Raithel, dem Vertreter von “Gemeinsam e.V.”, ein Scheck übergeben. Es ist wieder so weit: am 28. Juni 2019 stechen wir in See! Auf geht´s zur 4. Ammersee-Schifffahrt! Seien Sie unser Gast auf der MS Utting ! Am Dampfersteg in Stegen bei Inning am Ammersee beginnen wir um 18:30 Uhr mit einem Prosecco-Empfang. Gemeinsam werden wir um 19:30 Uhr ablegen und bei Musik, Tanz und gutem Essen Networking unter Freunden genießen! Freuen Sie sich mit uns auf das Highlight für diesen Abend: Lassen Sie uns gemeinsam hoch in den Himmel blicken und ein fantastisches Feuerwerk erleben! Etwa gegen 23:45 Uhr laufen wir wieder sicher in den Hafen in Stegen am Ammersee ein. Feiern Sie mit Familie Häckl, dem Team der Häckl Treuhand GmbH StBg und dem Organisations-Team des SEEhenFrühstücks die Unternehmer-Party des Jahres! 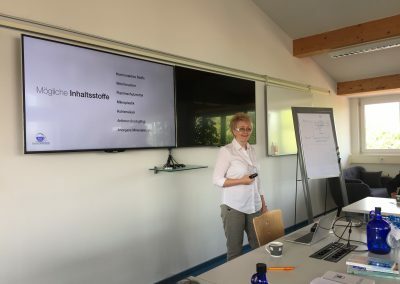 ORGANISATORISCHES – oder – WIE BIN ICH DABEI? Zur Gewährleistung unserer zuverlässigen Planung melden Sie sich bitte verbindlich an. Herzlichen Dank für Ihr Interesse und Ihre Unterstützung im Voraus! das SEEhenFrühstück lädt ein zum 31. 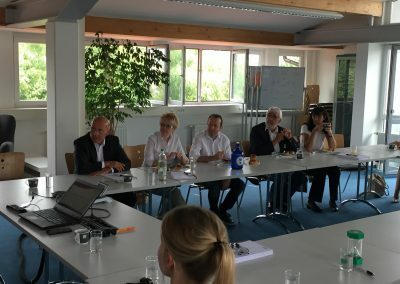 Netzwerk-Treffen in den Gasthof zur Post in Raisting mit anschließender Führung über das Gelände der Erdfunkstelle. Wir treffen uns am 12. April 2019 wie gewohnt um 8:00 Uhr im Gasthof zur Post, Floßmannstraße 9, in 82399 Raisting. Dort frühstücken wir und stellen uns vor. Dann wechseln wir die Location! Wir fahren zur Erdfunkstelle, ebenfalls in Raisting. Herr Martin erwartet uns zu einer 75-minütigen Führung rund um die Parabolspiegel und das Radom um 10:00 Uhr auf dem Parkplatz der Firma global eagle (ehem. emc). Er wird uns spannende Fragen beantworten wie zum Beispiel die Funktionsweise der verschiedenen Anlagenteile einer Erdfunkstelle und ihre Einbindung in das weltweite Netz. Von verschiedenen Standpunkten auf dem Gelände wird z. B. erläutert, was der Zweck der Erdfunkstelle ist, welche Aufgaben die verschiedenen Antennen haben und wie der Kontakt zu den Satelliten hergestellt wird. Was versteckt sich hinter der weißen Kugel des Radom? Was hat die Erdfunkstelle Raisting mit der Mondlandung von 1969, dem „Roten Telefon“ im Kalten Krieg oder der Olympiade 1972 in München zu tun? Wieso steht diese gewaltige Anlage gerade hier im Pfaffenwinkel, in Sichtweite des Kloster Andechs` und vor der grandiosen Kulisse der Alpen, mit dem Blick zur Zugspitze? Technische Vorkenntnisse sind nicht erforderlich! Bitte denken Sie an wetterfeste Kleidung. Sollte das Wetter uns nicht wohlgesonnen sein kommt Herr Martin zu uns in den Gasthof und wird uns dort die Erdfunkstelle mit Fotos und Berichten in der Theorie erklären. Seien Sie mit uns gespannt und seien Sie dabei! Also lassen Sie sich SEEhen Wir freuen uns auf Sie! Damit wir besser planen können bitten wir um verbindliche Anmeldung, z. B. auf veranstaltung@haeckl-treuhand.de oder www.seehenfruehstueck.de . Die Organisationsgebühr beträgt 18.- € pro Person. Sollte es Ihnen vorab nicht möglich sein, sich anzumelden dürfen Sie gerne auch spontan vorbei kommen. Alles unter einem Dach fanden die Gäste des 30. SEEhenFrühstücks am 15. März 2019 in Dießen im Gewerkhaus. Unser Gastgeber, Sattler Michael Ruoff, arbeitet im Gewerkhaus zusammen mit sieben anderen traditionellen Handwerkerinnen und Handwerkern. Herr Ruoff stellte uns an diesem Vormittag seine Werkstattleiterin Frau Judith Wiegmann, seine Arbeit und seinen Arbeitsplatz vor. Als Sattler beherrscht er natürlich die händische Herstellung von Zaumzeug und Pferdegeschirr genauso gut wie die Fertigung von Gürteln und Handtaschen. Sonderwünsche nimmt er sehr gerne entgegen und fertigt entsprechend seiner Kundenaufträge. Da bleiben keine Wünsche unerfüllt! Außerdem empfing uns Holzbildhauer Johannes Rößle. Er stellt Skulpturen auf seine ganz spezielle Art und Weise her – nämlich mit Motorsäge und Bohrmaschine. Ebenso fertigt er filigrane Modelle aus Holz, die später in groß nachgebaut werden. Gerne nimmt er Ihre Aufträge entgegen und gibt Ihren Wünschen und Vorstellungen eine Form. Herr Alfons Bolley schmiedet Messer. Aus hochwertigen Rohstoffen stellt er in seiner Messerschmiede die Klinge her und vollendet seine Arbeit mit dem handgemachten Griff. Hier können Sie auch Ihre Messer schleifen und reparieren lassen. Er freut sich auf Ihren Besuch! Aus dem Schneiderhandwerk kommt Frau Jolee Kerscher. Ihre Leidenschaft ist die Näherei. Sie ist Schneidermeisterin und hat Freude am Herstellen von Kostümen zu verschiedensten Anlässen, genauso wie auch am Nähen von Trachten und ausgefallener Kleidung aus jeder Zeitepoche. Ihr Atelier findet man direkt neben der “Türsteherin” mit einem schicken, barocken, tierblauen Kleid. Mit im Haus befinden sich außerdem noch ein Steinrestaurator, eine Polsterei, eine Trachtendesignerin und ein Restaurator für Möbel und Holzobjekte. Diese Koryphäen auf ihrem Gebiet waren zum Zeitpunkt unseres Treffens leider verhindert und so konnten wir nur Herrn Ruoffs Erzählungen über ihr jeweils großes Talent lauschen. Das Haus selbst ist schon recht alt und wurde früher unter anderem als Brauerei und dann als Krankenhaus genutzt. Wer zum Fortführen des heutigen Konzepts und zum Erhalt des Hauses beitragen will findet auf der traditionellen Holztreppe einen Spendenkasten. Die “Bewohner” selbst verpflichten sich durch einen gemeinschaftlichen Arbeitsplan zur Pflege der allgemeinen Flächen und des dazugehörigen Gartens. Übrigens blühten dort bereits zahlreiche Schneeglöckchen! Das Resümee dieses Besuchs lag eindeutig darin, dass man im Gewerkhaus hervorragende Qualität hervorbringt, dass jeder nachhaltig und umsichtig arbeitet, dass auch die sozialen Kontakte nicht zu kurz kommen, sich alle gegenseitig unterstützen und dass man auf fachkundige Beratung zählen kann. Schön zu sehen ist auch, dass sich die SEEhenFrühstücke großer Beliebtheit erfreuen und auch immer wieder neue Gäste kommen, sowohl aus eigenem Impuls als auch auf Empfehlung. Das Organisations-Team des SEEhenFühstücks bedankt sich herzlich für die Einladung bei Herrn Ruoff und allen Handwerkern, die uns inteessante Einblicke in ihr Schaffen erlaubt haben. Schön war´s! “Was für ein tolles Ambiente” waren die ersten Worte der Teilnehmer, als sie auf Schloss Höhenried am Starnberger See ankamen. Das Schloss ist ein Hotel, dass auch Tagungs- oder Seminarräume anbieten kann. Das Team des Schlosses bereitete das Kaminzimmer sehr nobel und hochklassig inclusive offenem Feuer für das Netzwerktreffen vor. Petrus schickte die schönsten Frühlings-Sonnenstrahlen und ließ Herrn Reinhard Häckl (Häckl Treuhand GmbH Steuerberatungsgesellschaft) und Herrn Roland Greppmair (K.E.R.N. die Nachfolgespezialisten) wahrhaft erleuchten! Herr Häckl erörterte in seinem Fachvortrag über Unternehmensnachfolge knifflige Aspekte, die man unbedingt beachten sollte wenn man für sein Unternehmen einen neuen Inhaber bestimmen will. Zum Beispiel wies er darauf hin, dass gewissen Umsatz- und Lohngrenzen bei der Übergabe beachtet werden müssen und außerdem nur bedingt Freibeträge gelten. Er riet, sich alle wichtigen Dokumente und Verträge selbst aufzubewahren und nicht auf “falsche Freunde” zu vertrauen. Auch die Zeit ist bei so einem Vorhaben ein wichtiger Faktor. Bereits 5 Jahre im Voraus sollte die Unternehmensnachfolge geplant werden. Bei Fragen wenden Sie sich gerne vertrauensvoll an Herrn Häckl, der unter anderem auch Fachberater für Unternehmensnachfolge ist. Als zweiter Referent dieses Vormittags sprach Herr Greppmair. Unter anderem stellte er fest, dass die Unternehmensnachfolge bereits bei der Gründung anfängt. Sein Thema Unternehmenskultur findet in manchen Unternehmen nur im Unterbewusstsein statt. Wann stellten Sie sich zuletzt die Fragen: “Ist das noch richtig, was und wie wir das tun?” “Was sind unsere Überzeugungen” “Wie denken wir? Denken wir gleich? Und handeln wir deshalb auch gleich?” “Sind unsere Wertevorstellungen die selben?” “Passen meine Ideale zu denen meines Arbeitgebers?”. Die Gäste hörten außerdem auch hilfreiche Tipps, wie ein Unternehmen seine Kultur pflegen und wahren kann. An diesem Vormittag wurden auch einige Geheimnisse gelüftet, warum manche Menschen gut – und andere weniger gut – zusammen arbeiten können. Herr Greppmair ist ausgezeichnet mit dem 9-Level-Zertifikat. 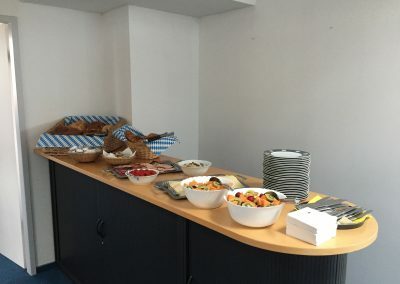 Anschließend genossen die SEEhenFrühstücker die angenehme Atmosphäre und das reichhaltige Frühstücksbuffet. 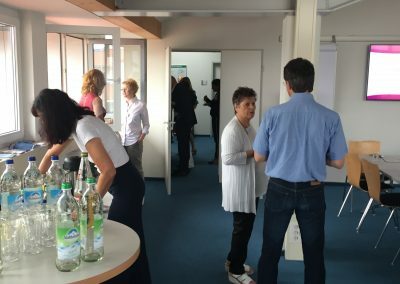 Auch bei diesem Treffen entstanden wieder einmal neue Bekanntschaften, die für die jweiligen Geschäftspartner sehr inteessant sind und bald auch vorteilhaft für´s Business sein werden. Das Organisations-Team des SEEhenFrühstücks freute sich über die rege Teilnahme und bedankt sich sehr beim Team des Schlosses Höhenried für die führsorgliche Gastfreundschaft und die anschließende Führung! Herzlichen Dank auch an Herrn Greppmair für seinen kompetenten Fachvortrag! Ohne Schnee und bei nasskaltem Wetter trafen sich Freunde und Bekannte der Familie Häckl und des SEEhenFrühstücks auf dem kleinen aber feinen Christkindlmarkt im Greifenberger Schloßhof zum besinnlichen Jahresausklang. Bei Glühwein und anderen Köstlichkeiten konnte man schön das Jahr Revue passieren lassen, sich nett unterhalten und gemeinsam erinnern. Auch Herr und Frau Häckl waren mit von der Partie und freuten sich über die zahlreichen Besucher. 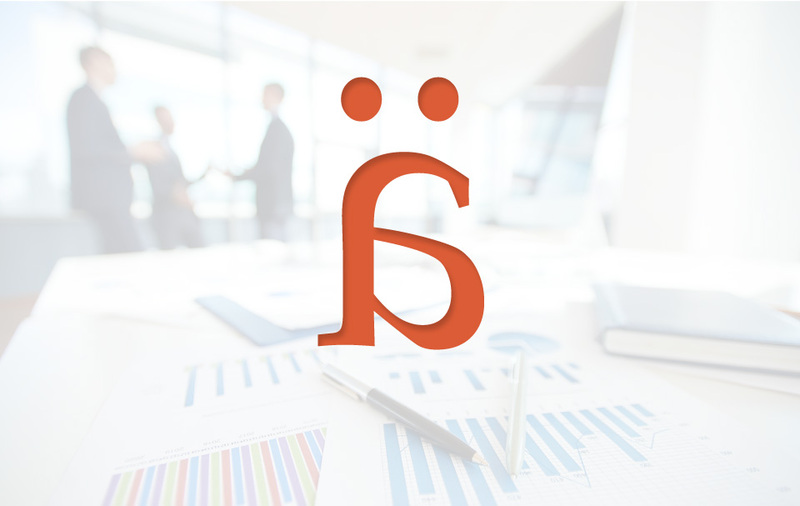 Die Häckl Treuhand GmbH StBg und das Organisationsteam des SEEhenFrühstücks wünscht Ihnen ein fantastisches 2019! Wir freuen uns auch im neuen Jahr auf ein Wiedersehen, den Austausch und eine gute Verbindung mit Ihnen! 28. SEEhenFrühstück in Dießen bei Keramik Hudler war großartig! Ganz privat in ihre Werkstatt lud Frau Gabriele Buchner, Keramik-Meisterin, die Gäste des SEEhenFrühstücks zu sich nach Dießen ein. Sie bereitete mit viel Geschick und Liebe zum Detail ihre Räume für den Besuch vor. Es gab dort viel zu bestaunen, vor allem bei dem exklusiven Blick hinter die Kulissen. Bei Keramik Hudler finden Sie einen sehr geschmackvoll und schön dekorierten Verkaufsraum, in dem viele Gegenstände des alltäglichen Gebrauchs aus Ton angeboten werden. Sollte ein Kunde dort nicht fündig werden schöpft Frau Buchner aus den Vollen und kann ihr Sortiment hinter einer sonst verschlossenen Tür sofort vergrößern. Auf Wunsch können natürlich Sonderanfertigungen aller Art hergestellt werden. Wie das geht durften die Gäste an diesem Vormittag selbst live erleben. An der Töpfer-Drehscheibe ist die langjährige Handwerkerin eine wahre Koryphäe. In nur wenigen Augenblicken wid aus einem Tonklumpen ein einwandfrei gleichmäßiges Gefäß, dass dann je nach Phantasie oder Bedarf weiter bearbeitet werden kann. Fachkundiges Wissen und Sorgfalt lassen in ihren geschickten Händen wunderschöne Unikate entstehen. Außerdem beherrscht Frau Buchner auch die Kunst, Dinge der gleichen Art mehrere Male identisch anzufertigen, sodass z. B. ein Service entsteht. Die Teilnehmer waren völlig gefesselt während der Voführung und konnten den Blick nicht abwenden. Die Meisterin ging voll und ganz in ihrem Beruf auf und riss alle in ihrer Begeisterung mit. So bemerkte auch keiner, dass die Zeit wie im Flug verging und inzwischen sogar die Sonne schien. Frau Buchner freut sich über Ihren Besuch in der Töpferei, bittet allerdings um vorherige telefonische Anfrage. Vielen Dank. Das Organisations-Team des SEEhenFrühstücks bedankt sich für die Gastfreundschaft und den einzigartigen Einblick in dieses alte Handwerk! Bei strahlendem Sonnenschein empfingen Hr. Norbert Wurm (Regionalleiter Firmenkunden), Hr. Stefan Peer (Firmenkunden-Berater) und Hr. Thomas Baar (Leiter Zahlungsverkehr) die SEEhenFrühstücker im Oktober in den Räumen der VR-Bank in Herrsching. Den Netzwerkern wurde der Vorzug eines sehr angenehmen Tagungsraums mit anschließender Dachterrasse und einem Blick auf den Ammersee gewährt. Doch das sollte nicht alles sein, was die VR-Bank zu bieten hatte. Herr Baar nahm alle Anwesenden mit auf eine Reise in die digitale Welt der Bank. Er erläuterte Zahlungsmethoden, Sicherheitsvorkehrungen, Vereinfachungen, Ansprüche und Anforderungen, die in der heutigen Zeit vorausgesetzt werden. Außerdem sprach er auch wichtige Neuerungen in der Rechnungsstellung an, vor allem im Zusammenhang mit öffentlichen Einrichtungen / Kommunen. Zur Erfüllung dieser Bestimmungen gibt es sogar einen Stichtag – was die wenigsten Teilnehmer wussten…..
Ergänzend sprach Herr Peer die elektronische Übermittlung von Steuererklärungen von Kunden oder Steuerberatern an die Bank an. Das sei die Zukunft! Herr Häckl fügte hinzu, dass seine Kanzlei diesen Service bereits seit einiger Zeit bieten kann und dieser auch gerne genutzt wird. Auch in den Steuerkanzleien hält die Digitalisierung Einzug! Als langjähriger Geschäftsmann kennt Herr Häckl die Bedürfnisse seiner Mandanten und stellt frühzeitig die Weichen in Richtung Fortschritt. Alle waren sich am Ende einig: Das war wieder einmal ein gelungenes Treffen! 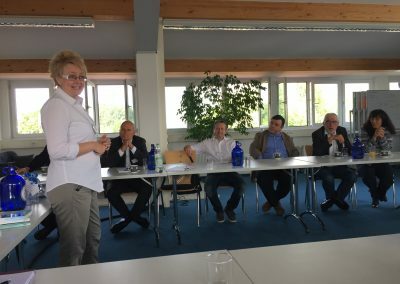 Das Organisations-Team des SEEhenFrühstücks bedankt sich herzlich bei den Gastgebern der VR-Bank Starnberg-Herrsching-Landsberg für die Bereitstellung der Räumlichkeiten und den äußerst informativen und hochinteressanten Vortrag! „Die erste Werkstatt“ im Ölbergweg 12 in Gilching war das Ziel der SEEhenFrühstücker nach der Sommerpause, die sich im September bereits zum 26. Mal trafen. Die Inhaber, Herr und Frau Zimmermann, waren ausgezeichnete Gastgeber und stellten ihr Unternehmen vor, das sich durch vielfältige Geschäftsfelder deutlich von einer herkömmlichen Schreinerei abhebt. Ihr Spezialgebiet ist die Restaurierung von alten Möbelstücken oder auch die Rekonstruktion historischer Bauteile aus Holz wie zum Beispiel Fenster, Türen oder Treppen. Direkt in der geräumigen Werkstatt stellte die Familie hübsch dekorierte Sitzgelegenheiten auf. Die warme Atmosphäre des Werkstoffes Holz war allgegenwärtig und verbreitete Gemütlichkeit. Ziel der Unternehmer ist es unter anderem, mit ihrer Arbeit Menschen glücklich zu machen. Für dieses Treffen kann gesagt werden: GESCHAFFT! Herr Marc A. Pletzer von der fresh-academy aus Feldafing ließ uns mit seinem Vortrag eintauchen in die Welt des NLP (Neurolinguistisches Programmieren). Mit dieser Technik ist Hr. Pletzer international unterwegs. Nicht immer war er im Bereich Training aktiv. Er startete seine Karriere als IT-Journalist zu einer Zeit, als die IT noch in Kinderschuhen steckte. Einige seiner damaligen Erkenntnisse ließen ihn einen neuen Weg einschlagen, den er heute aus vollster Überzeugung und mit ganzer Kraft geht. Er stellte sich und den Teilnehmern kritische Fragen. Eine davon lautete: „Leben Sie das Leben Ihrer Träume?“ Er erinnerte daran, dass unsere Lebenszeit das wertvollste Gut ist, das wir verteilen können und sie das Äquivalent zur Wichtigkeit darstellt. Diese und viele Wahrheiten mehr wurden an diesem Vormittag ausgesprochen. Mehr sei aber an dieser Stelle nicht erzählt. Herr Pletzer verrät mehr dazu in seinen Seminaren! Als Dankeschön und in alter Tradition überreichte Herr Häckl einen Gutschein für eine kostenlose Teilnahme an einem zukünftigen SEEhenFrühstück an Frau Zimmermann und Herrn Pletzer. 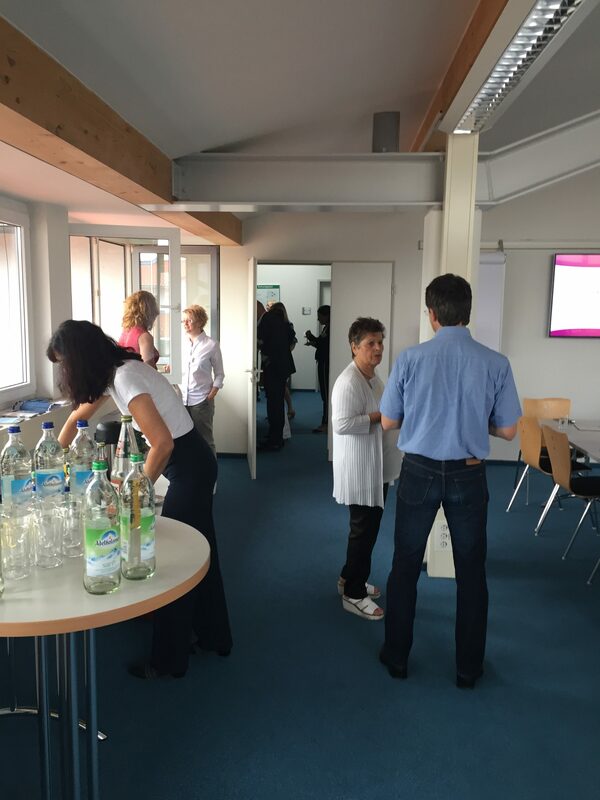 Das Organisations-Team des SEEhenFrühstücks bedankt sich herzlich bei allen Mitwirkenden für die gelungene Gestaltung dieses Vormittags! Am 6. Juli 2018 legte Reinhard Häckl mit seiner Frau Marianne, seiner Tochter Caroline Häckl-Meyer und zahlreichen Freunden, Mandanten und Geschäftspartnern zur 3. Ammersee-Schifffahrt ab. Trotz des wechselhaften Wetters war die Stimmung sehr gut und die entspannte Atmosphäre zum Knüpfen neuer Kontakte ausgesprochen angenehm. Die Gäste, aus dem gesamten Süddeutschen Raum stammend, genossen das feine Essen, die sehr nette Gesellschaft bei Musik und Tanz und natürlich das fulminante Feuerwerk! Im Rahmen dieses Ereignisses ließ es sich die Familie Häckl nicht nehmen, auch an die weniger gut situierten Menschen in ihrer nächsten Umgebung zu denken. Herr Raithel, der den Verein “Gemeinsam e.V.” vertritt, nahm dankend einen Spendenscheck entgegen. Wer nächstes Jahr wieder – oder auch zum ersten Mal – dabei sein will reserviert sich den 28. Juni 2019. Die Firma PTC Telecom GmbH in Wörthsee (Am Anger 5) lud die SEEhenFrühstücker im Juni ein. Herr Dorn stellte das Unternehmen vor, das es seit 30 Jahren gibt, das inzwischen 60 Mitarbeiter beschäftigt und in seiner Geschichte schon viel erlebt hat. Er erzählte von den Anfängen, als die klassiche Telefonanlage einziges Thema war. Heute befasst sich die PTC Telecom GmbH mit der Ablösung der alten Techniken und natürlich den neuen Aufgabenfeldern wie zum Beispiel künstliche Intelligenz. Um sicher zu stellen, dass jeder Mitarbeiter immer auf dem neuesten Stand ist, werden regelmäßig Schulungen besucht. Außerdem zeichnet das Unternehmen aus, dass in den Bereichen Voic – Cloud – Applications – Integrations – Data alles aus einer Hand angeboten werden kann. Anschließend hörten alle Gäste den interessanten Fach-Vortrag von Frau Corina Puskaric. Frau Puskaric ist Referentin der Wassertankstelle. Hier handelt es sich um zellverfügbares Wasser für das „Wasserwesen Mensch“. Sie klärte auf, welche Massen an Schadstoffen in unserem Trink- und Mineralwasser vorhanden sind. In vielen Gesichtern der Teilnehmer war das Entsetzen leicht zu erkennen! Der Mensch besteht zu 70 % aus Wasser, außerdem aus 70 Billionen Zellen. 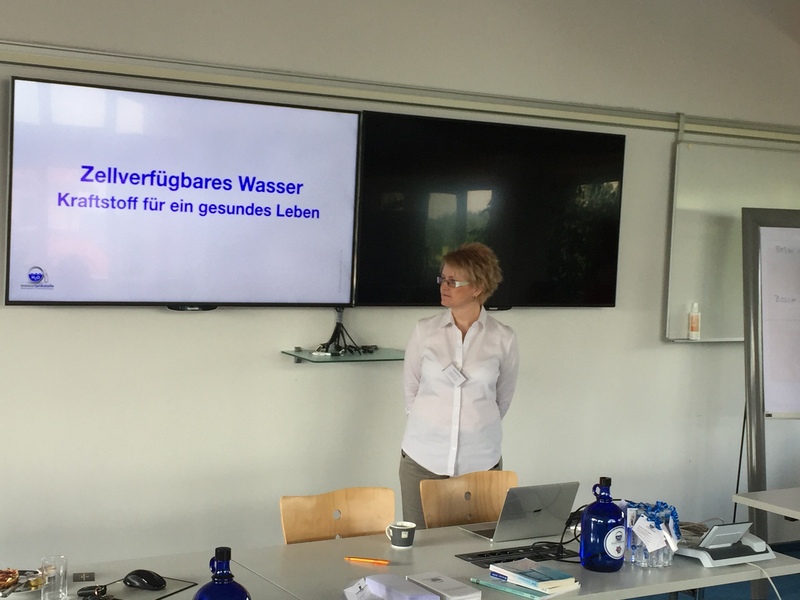 In unserem Körper laufen 80.000 km Wasserleitungen…. Sind Sie nicht auch der Meinung, dass wir darauf achten sollten? …. war die Frage, die abschließend gestellt wurde. 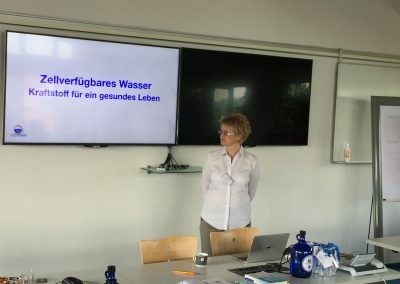 Im Anschluss konnte jeder interessierte Gast sein eigenes mitgebrachtes Wasser direkt testen lassen. Die Ergebnisse waren durchaus überraschend. Bestenfalls sollte der angezeigte Wert unter 90 liegen. Nur zwei Wässer unterschritten diese Grenze. 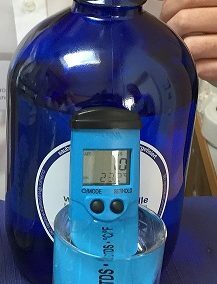 Das Wasser der Wassertankstelle erreichte mit Abstand den besten Wert von 10! 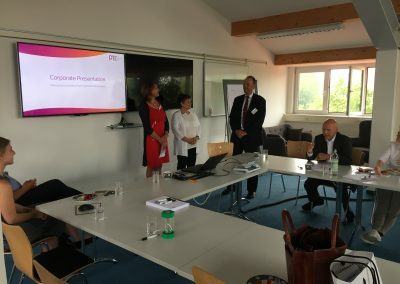 Das Organisations-Team des SEEhenFrühstücks bedankt sich ganz herzlich bei der Firma PTC Telecom GmbH für die Gastfreundschaft und den aufschlussreichen Eindruck in ihr Geschäftsfeld! Genauso gilt der Dank Frau Corina Puskaric für die Mühen und den erkenntnisreichen Vortrag! Mit dieser Erkenntnis beendete Sarah Hirzinger von d-made aus Seefeld ihren mitreißenden Vortrag über einen gelungenen Vortrag. In zehn Stichpunkten legte sie dar, was eine Rednerin oder ein Redner unbedingt tun oder unbedingt lassen sollte. Eine halbe Stunde genügte, um alles Wichtige auf eine absolut geniale Art und Weise auf den Punkt zu bringen. Vielen Dank dafür! Im Anschluss ließen sich die Gäste des Unternehmer-Netzwerktreffens das delikate Frühstück im „Alten Wirt“ in Hechendorf / Seefeld schmecken. Mit viel Geschmack präsentierten die Wirtsleute, die erst seit einem Jahr den Landgasthof und das Hotel führen, ein überaus reichhaltiges und gutes Essen. Das Hotel war kurz vor den Pfingstferien voll ausgebucht. Trotzdem empfingen sie die SEEhenFrühstücker und es fehlte an nichts. Gerne begrüßt das Team auch Gäste zum Mittagessen oder lädt in den Biergarten ein! Herzlichen Dank für Ihre Gastfreundschaft! Das Organisations-Team freute sich wieder über eine bunt gemischte Runde an Teilnehmern. Wie immer waren zahlreiche Berufsstände und Dienstleistungsanbieter vertreten. Das SEEhenFrühstück erfreut sich immer größerer Bekanntheit und auch Beliebtheit. Trotz des Brückentags durften Herr und Frau Häckl, Frau Braun und Frau Thalmayr wieder neue Gäste begrüßen und kennen lernen! From Munich: Autobahn A96 – Exit Greifenberg-Schondorf. In Schondorf, pass the pharmacy on the left and turn left into Wiesenweg. After 100 meters Wiesenweg turns left in a 90-degree angle, then after 50 meters you’ll arrive at Häckl offices on the left. From the south: Pass through the town of Diessen and cross the train tracks, then turn right into Wiesenweg and follow the instructions above. The legal name “Steuerberatungsgesellschaft” (tax consultancy firm) has been awarded in the Federal Republic of Germany. The professional titles “Steuerberater / Steuerberaterin” (tax consultant), “Rechtsbeistand” (legal advisor) and “Fachberater für internationals Steuerrecht” (expert advisor for international tax law) have been obtained in the Federal Republic of Germany. The current wording of the respective legislation can be accessed online at Bundesverband deutscher Rechtsbeistände (www.rechtsbeistand.de) under the keyword Berufsrecht. Supervisory Authority: Amtsgericht Augsburg Am alten Einlaß 1 86150 Augsburg Email: poststelle@ag-a.bayern.de Professional liability insurance is covered by ERGO Versicherung AG, Victoriaplatz 1, 40198 Düsseldorf. Insurance coverage for activities within Europe. Every access to our website and every download of a file from our website is logged. The storage serves internal system-related and statistical purposes. The following are recorded: the name of the file, date and time of access, data volume transferred, notification of successful download, web browser and requesting domain. Additionally, the IP addresses of the requesting computers are logged. Further personal data is only collected if you provide this information voluntarily as part of an inquiry or registration. If you have provided us with personal data, we only use these to respond to your inquiries, to process contracts concluded with you and for technical administration. Your personal data is only passed on to third parties or otherwise disclosed if this is necessary for purposes of processing the contract – especially the transfer of order data to suppliers –, for billing purposes, or if you have given your prior consent. You have the right to revoke your consent with future effect at any time. The personal data stored is deleted if you revoke your consent to storage, if it is no longer needed to fulfil the purpose for which the data was stored, or if its storage is inadmissible for other legal reasons. On written request, we are glad to inform you about your personal data stored by us. Pursuant to § 4 Abs 2 Sentence 2 BDSG, the Data Protection Officer must make all information listed in § 4e BDSG available to any person, upon request, in a suitable manner. We hereby directly comply with this requirement. As a result, you do not have to personally request this information. The personal data collected by Häckl Treuhand GmbH Steuerberatungsgesellschaft shall solely be used for fulfilling client mandates. These may contain any activities related to tax consulting, auditing and financial advisory services as well as the compilation of balance sheets, annual reports and tax declarations, accounting, payroll accounting, company audits and escrow services. The collection, use and transfer of data related to Human Resources administration is performed in fulfilment of our own purposes and in order to meet the stipulations of the law and the requirements of the social security services. Internal staff who are involved in carrying out and performing the relevant business listed under point 4. External bodies where necessary for the fulfilment of the purposes specified under 4. Data is deleted after the expiry of the retention periods prescribed by the law, articles of association or contract. Provided that data is not affected by this, it is deleted when the purposes specified under point 4 cease to apply. No transfer of data to third parties is currently planned. However, such transfer can be executed in individual cases and after prior consent by the client. Technical and organisational precautions are in place to safeguard any data administered by Häckl Treuhand GmbH Steuerberatungsgesellschaft against intended or accidental manipulation, loss, destruction or unauthorized access. Security measures are continuously improved in line with technological progress. Specifically this means that any privacy-protected data is stored on secured systems within Germany. Back-up files are stored every day to avoid loss or accidental destruction of data. These can only be accessed by authorised staff who are trusted with processing data or with technically supporting the IT systems. These staff members have committed in writing to complying with the data protection guidelines as stipulated in § 5 BDSG. The content of our website has been compiled with meticulous care. However, we cannot assume any liability for the accuracy, completeness and the up-to-dateness of the contents and information provided. Using this website’s content is at user’s own risk. The mere use of this website does not result in a contractual relationship between the user and the provider. This website contains links to the websites of third parties (“external links”). The providers of the linked websites are liable for the content and accuracy of the information provided. At the point in time when the links were placed, no infringements of the law were evident. The provider does not have any influence on the current or future content or design of the linked websites. A permanent monitoring of these external links without any concrete indication of a breach of law is not appropriate for the provider. As soon as an infringement of the law becomes known to us, we will immediately remove the link in question. The contents published on this website are governed by the copyright and intellectual property laws of Germany. Any utilisation beyond the scope of copyright / intellectual property law shall require the prior written consent of the provider or copyright owner in question. This is particularly true for any duplication, processing, translation, storing and distribution of contents in data bases or other electronic media and systems. Unauthorized duplication of website contents or of the complete website is not permitted and against the law, with the exception of copying and downloading for personal, non-commercial use.